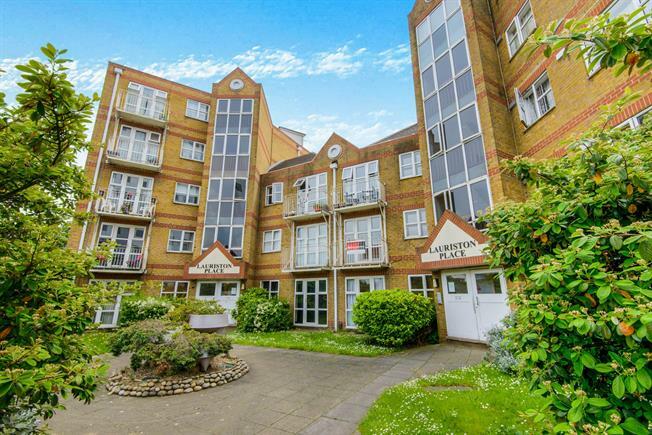 2 Bedroom Flat For Sale in Southend-on-Sea for Offers in excess of £160,000. We present this purpose built third floor apartment with two double bedrooms, an allocated parking space in a gated residents car park, communal garden and a west facing balcony. The additional accommodation comprises a living room, a modern fitted kitchen and a modern fitted bathroom. Benefits include double glazing, electric heating and a lease term of 171 years remaining and no onward chain. The property presents ad an ideal first time buy or buy to let investment purchase. Viewing Advised. Via secure entry phone to communal entrance hall with lift and stairs to all floors. Textured coved ceiling, built in storage cupboard, wall mounted electric storage heater, wood effect laminate floor. Textured coved ceiling, two double glazed windows to side aspect, double glazed door to side aspect and balcony. Wall mounted electric storage heater, wall mounted secure entry phone, Fitted carpet. The balcony is access via the living room and is west facing. Textured ceiling, two secondary glazed windows to side aspect, wood effect laminate flooring. Built in storage cupboard. A range of matching wall mounted and base units with rolled edge work surface, single bowl sink unit inset and tiled splash backs. Integrated electric oven and integrated electric hob. Spaces for appliances. Wall mounted overhead electric heater. Textured coved ceiling, secondary glazed window to side aspect, wall mounted electric storage heater and fitted carpet. Textured coved ceiling, secondary glazed window to front aspect, wall mounted electric storage heater and fitted carpet. Textured Ceiling, obscure double glazed window to side aspect, wall mounted overhead electric heater. A modern white suite comprising a panelled bath with shower over, pedestal wash hand basin and low flush WC, part tiled walls and splash backs. Laminate floor. The communal Garden is located at the front of the Lauriston Place Complex.